Here in Taylorsville, Kentucky at the Nazareth House Apostolate center, St. Simeon Skete, we await the arrival of some intense storms. Most of the warnings have been telling us that the chances of tornadoes are very high. LOW-LEVEL ENVIRONMENT...AND THE LIKELIHOOD OF A FEW DISCRETE WARM SECTOR SUPERCELLS / AND SUPERCELLS WITHIN THE LINE ALONG THE FRONT/...ALL APPEAR SUPPORTIVE OF A POTENTIALLY SIGNIFICANT TORNADO EPISODE WITH A FEW LONG-TRACK/STRONG TORNADOES. 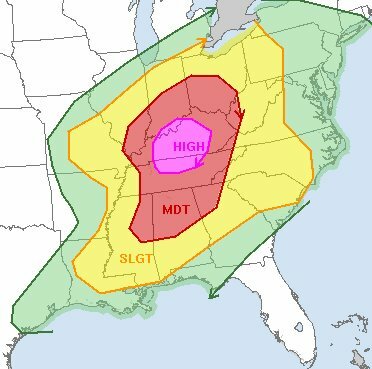 THE MOST PROBABLE AREA FOR DAMAGING TORNADOES WILL BE SE OF THE SURFACE LOW TRACK IN THE MORE ESTABLISHED WARM SECTOR...OR NEAR AND S OF THE OH RIVER FROM EXTREME SRN INDIANA INTO CENTRAL KY/NRN MIDDLE TN. BOTH PRE-FRONTAL AND FRONTAL SUPERCELLS ARE MOST PROBABLE IN THE HIGH RISK AREA...AND SOME OF THESE STORMS COULD SPREAD AS FAR NE AS SW OH AND WRN WV BEFORE EXITING THE WARM SECTOR THIS EVENING. OTHERWISE...DAMAGING WINDS AND LARGE HAIL CAN ALSO BE EXPECTED WITH THE PRE-FRONTAL AND FRONTAL STORMS THROUGH THIS EVENING. While we wait to see what today's weather will bring, the students at the NHA School, Kabala are waiting themselves. They have been asked to wait outside while the teachers prepare the report cards. Each student anxiously waits to see the scores that indicate the progress of their studies. As times ticks away, they ponder and hope for the best. Looking across the way, they see friendly faces at the NHA Compound and decide to go over and wait it out there. hanging out at the Compound proves to be a good distraction from the wonder and wait. Its a happy place. And these students and all of us from Nazareth House Apostolate want to thank you for your prayers, love and support ...and for making possible so many smiles. God bless you all.